Weiter Wo ist sie? / Where is she? 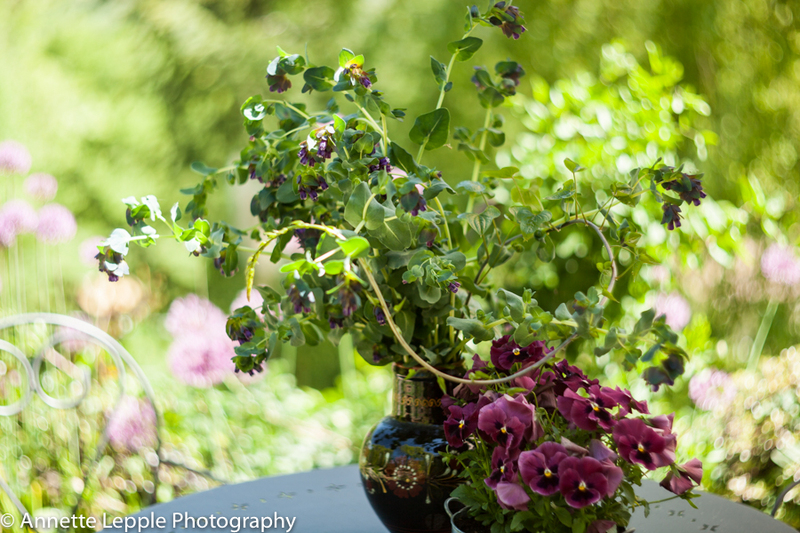 I’ve used Cerinthe today too, in my vase; it is such a useful plant. When I was in the south of Italy a couple of weeks ago I saw the native wild form growing which is identical but with yellow flowers. I think these are just as attractive but I’ve never seen them in gardens. Sadly it was too early for there to have been any seeds but I will try to seach for some. Glad I’ve included that sets me apart, Cathy, and edible too. 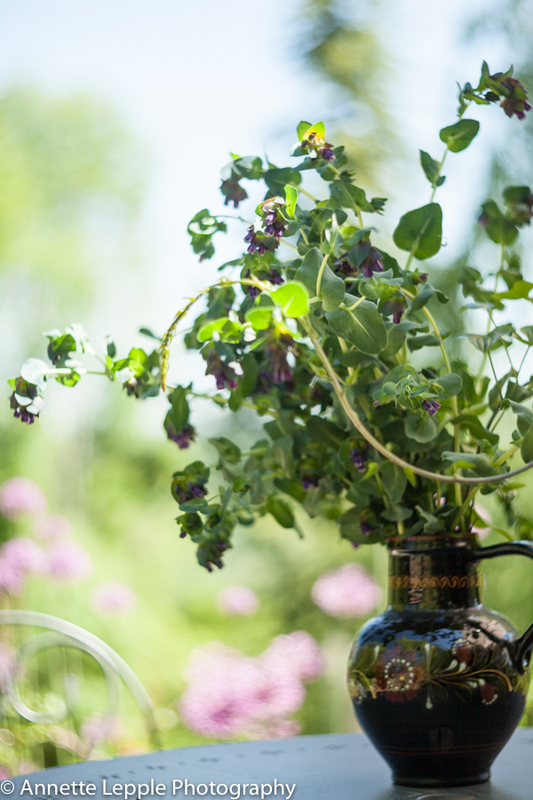 Black briony is the English word in fact and the tips can be harvested early. Bet Hugh Fearnley-Whittingstall would have something to say to that! What a lovely vase. Cerinthe is a“new“ plant for me…a winner. It sure is, John, and such a humble thing too, wouldn’t want to miss it for anything. Ist ein ‚must have‘ in meinen Augen, liebe Sabine, und hat diesen Winter -7°C ohne zu murren überstanden. Im Wallis war sie allerdings einjährig, harte Winter sind nichts für sie. Your happy wanderers amke a lovely vase. Cerinthe rambles through my garden too but never appears in large numbers and our summer temperatures usually send it packing. the Dioscorea is new to me. I like the movement is adds to your vase. It doesn’t mind the heat here but its seeds only germinate with the first autumn rains, Kris, otherwise it’s really drought- tolerant. 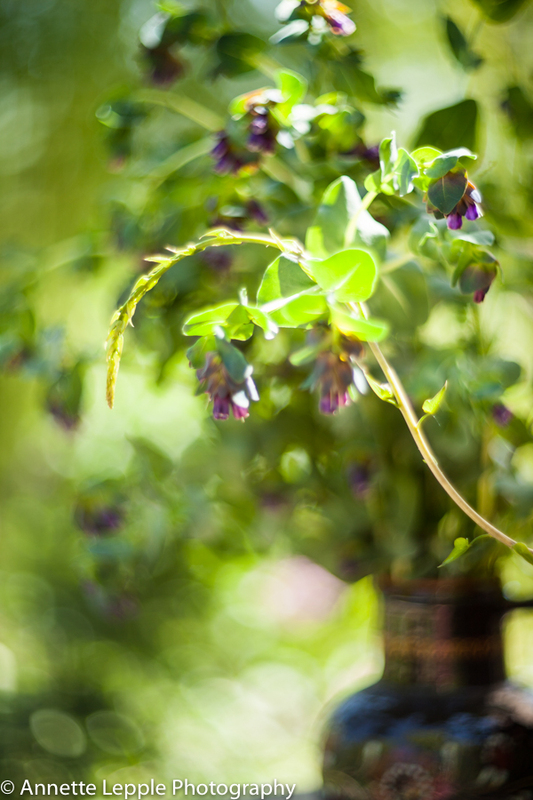 Cerinthe is beautiful and what’s not to like about an easily-removed self spreader. I never have seen it growing in my area but something to research. Dioscorea is unusual. The little pitcher holding your flowers today is very pretty Annette. Lovely wildlings, Annette! I adore Cerinthe, but seem to have lost quite a few seedlings in the very cold winter – some still battling on near a warm wall! Hopefully when we get some rain others will pop up to replace them. Mine stood up to -7°C this winter, Cathy, and I was surprised to see them get through that unharmed. In Switzerland I grew them as annuals. Your winters must be a lot tougher than ours. I think we had nearly -20 C here this winter. Ours are always annual/biennial. I remember seeing quite a few seedlings in the autumn last year, but they mostly seem to be gone now, except for right up near the rampart walls in the warmest part of the garden. Hopefully there’s more seed in the ground – I do have trouble with self-seeders due to the heavy clay. Some like it, others not so happy. Cerinthe was really just beginning to establish. 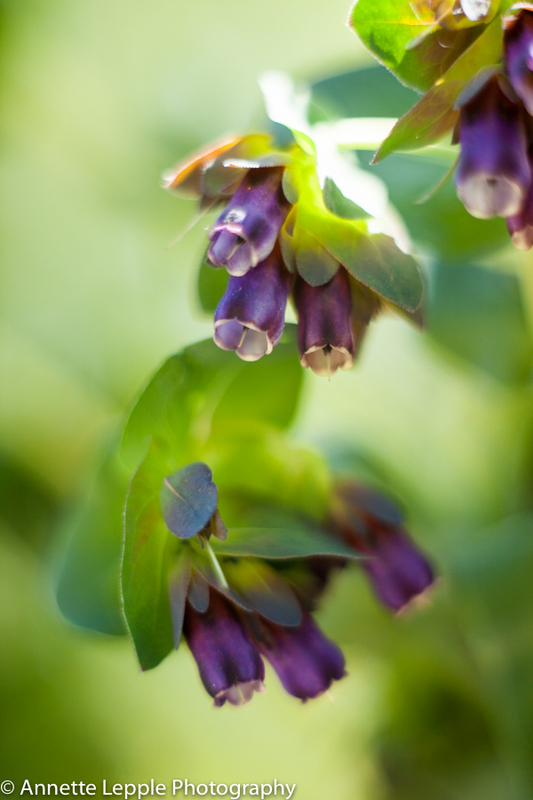 I love Cerinthe, but it didn’t grow for me when I tried it once a few years ago. That little climber is equally pretty though. I have never heard of it either and looked it up in German – Gemeine Schmerwurz. Prefer the English name! Cathy, I think they wouldn’t survive your cold winters but you can always grow them as annuals which is what I’ve done in the alps. It’s wonderful seeing your Cerinthe, Annette! And your description is perfect 🙂 I have felt very honored that it has begun seeding around in my very hot, dry little garden… though mine are about finished for the season now. They are definitely annuals here, dying off in the summer, but they have done such a lovely job through the cooler months. Thank you, Julie, I keep some seeds for you 🙂 PS: If you can’t make it I can send them.